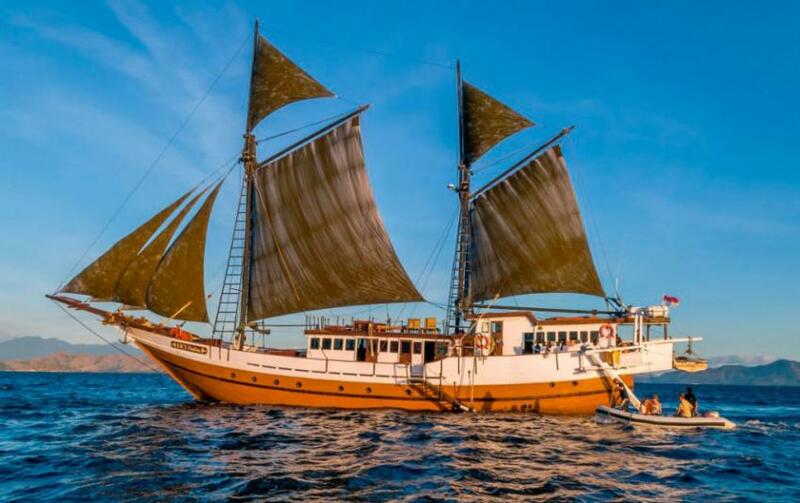 Ondina liveaboard is a traditional phinisi sailing boat. The yacht was built in 2001 since that time she offers safaris in Indonesia. 8 Ondina’ cabins can accommodate 16 passengers. All rooms are ensuite and air-conditioned. There are 6 cabins with double beds, other 6 rooms have double and upper single bed. Big boat's salon has everything to comfortably spend time after diving or in between dives. It is combined with dining area where meals are served Ondina’ passengers can use boat's library, watch TV, listen to music. There is also an open-air zone with tables and sun loungers. It is ideal to relax under the sun and watch gorgeous marine scenarios. Ondina has everything to ensure safety on board. First aid kit, emergency evacuation DAN “Oxygen Unit”, emergency rafts, life jackets, firefighting equipment. Dive deck of Ondina is spacious, equipped with rinsing facilities to maintain diving gear after dive. There are storage places for every diver and charging points. Ondina offers special facilities for photographers. There is a big camera table, comfortable to work with a camera, separate rinsing tanks, charging points with 220volt electricity. Ondina offers various itineraries including Komodo, Raja Ampat, Cendrawasih Bay. Komodo Island is a variety of underwater landscapes. Pinnacles and underwater mountains covered with numerous of hard and soft corals. Lots of different fish live in this formations, including some of the pelagics. This is also a great destination for macro diving. Ondina offers a land program to Komodo National Park. You can see famous Komodo dragons. Raja Ampat hold worlds record of the biggest amount of corals and fish, you can see during the dive. Gorgonian fans and sponges, reefs covered with numerous hard and soft corals attract enormous schools of fish and sharks. Some of the rare fish can be spotted in Raja Ampat, like wobbegongs. Cendrawasih Bay is great for diving with whale sharks. Divers can observe these large creatures from June till September. There are also great opportunities for wreck diving. There are some sunken ships and airplanes that lie on the bottom of Cendrawasih Bay. Indonesia is great for diving all year round, best season depends on a destination. For the most destination that Ondina offers high season begins in April and lasts till August.